This week has been super busy, but in a good way. After several weeks of having my friends come to me, I’ve spent several days this week going out to lunch with Elliott and friends. On Tuesday, we took my best friend Candace out to lunch for her birthday to 300 East. Yesterday, we went to Cowfish with my friend Emily and her sweet little girl and I finally got some good sushi after not eating any raw fish for 10 months. Today, we met my sister-in-law and my nephew Grayson at Starbucks and tomorrow we’re going to brunch with some mommy friends and their babies at Zada Jane’s. I think I’ve more than made up for the time I’ve spent at home with Elliott. But all this running around with ladies who lunch has meant that I’ve had limited time to go to the grocery store. I’m currently struggling with getting more than one thing done outside the house in a day. Luckily for E and me, we’ve been able to be very social this week because we had more than enough stuff to work with in the fridge and pantry. And I like coming up with meals on the fly. 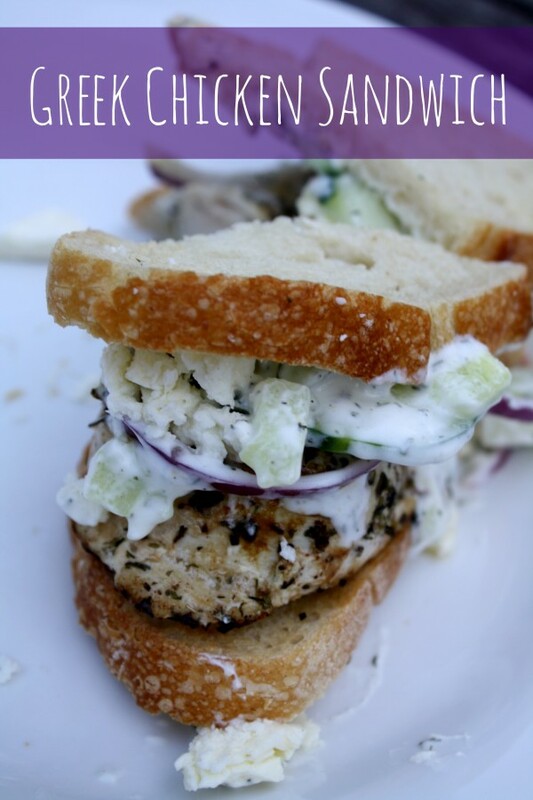 I knew I wanted to make chicken sandwiches and the only cheese we had was feta so I put two and two together and came up with this Greek chicken sandwich. 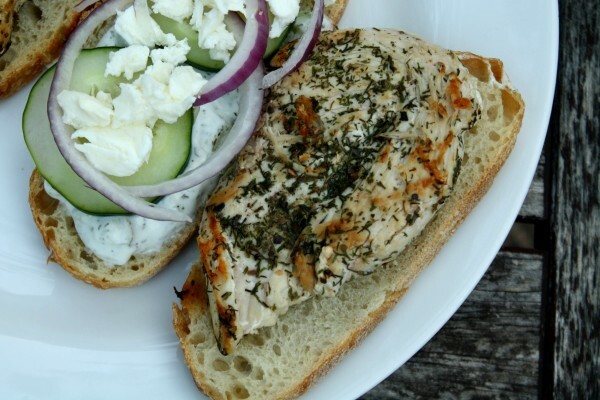 All of the yummy flavors you love in Greek food, all wrapped up in a sandwich! Warm oil in a pan or skillet on medium heat. Sprinkle both sides of chicken with herbs and spices. Place chicken in pan and cook on both sides until thoroughly cooked through. In a small bowl, stir together ingredients for the tzatziki sauce. Toast bread then assemble sandwich. 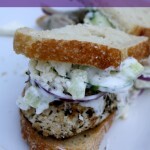 Place chicken on one piece of bread and top with tzatziki sauce, cucumbers, onion, and feta cheese. Top with a second piece of bread and slice in half. Repeat for the second sandwich.